At the Denver Cat Company, you can do your holiday shopping amongst cats! Denver! My fantasy football team made it into the playoffs, so everyone can just relax now. This week you should take advantage of some cool movie events (including The Graduate on the big screen and The Big Lebowski in a brewery), a Spanish-language meet-up, more local holiday markets, comedy, karaoke, a beer & cookie pairing, live storytelling, cartoons, cereal, and LOLing. European quaintness in the heart of BroDo? Yes, it’s true. Skyline Park has once again been transformed into a traditional German Christmas Market. German music, big beers, a heated beer tent, Gluhwein, soft pretzels, European desserts, Christmas knickknacks, and twinkling lights will round out this festive experience. Peep their website for additional hours and entertainment schedule. They’ll be lots-o-beers to choose from at OMF’s two-year anniversary jammy jam. Food provided by Texorado BBQ; lively merriment provided by you. No cover! Do you speak Spanish or kind of speak Spanish? Have you been looking for an opportunity to practice? Then dust off those tildas and head on over to Hooked on Colfax this Friday night to have some drinks, roll your Rs, and make some new amigos. Como se dice, “The freaks come out at night”? FREE. Beautiful babies of Denver, come dance it out at one of Denver’s favorite indie rock dance nights. This Friday, dance-floor destroying DJ duo Mike Disco & Electric Cameltoe join Lipgloss founder Hollow to make sure you get your dancing quota filled. To sweeten your evening, there will be $1 PBRs and $3 wells from 10 – 11pm. Otherwise, it’s only $5 for a whole lotta magic. Life is short; go to Lipgloss. You’ve played drinking games at home, now play them with the Denver Film Society! They’ll give you the rules and thanks to Breckinridge Brewery, the first 50 guests get their first drink on the house! Drink specials run all night long, with a bar in the theater so you won’t miss a second of the movie (thank god). Tickets run $7 – $10. Please drink and watch responsibly; only guests 21 and over will be allowed to attend Films on Tap screenings. The Horseshoe Craft & Flea Market is a seasonal market where emerging, undiscovered, and experienced artists, crafters, and antique/vintage collectors in Denver can set-up their own shop and meet their customers. It’s a rare and wonderful shopping destination where customers can engage with and buy directly from local makers, creators, and collectors. You’re sure to stumble upon some pretty awesome finds! Market runs 10am – 5pm both days. FREE admission. Plan on attending the holiday installment of the Denver Handmade Homemade Market (HAHO) this weekend in the Santa Fe Arts District. The HAHO is a place where you can find local, high-quality arts, crafts, food, and one-of-a-kind products made by your neighbors and friends here in Denver. The event also includes live music and homemade food. Additionally, there will be a clothing swap happening, so bring your gently used clothes while you’re at it. Market runs 1 – 7pm each day. FREE. Rocky Mountain Feline Rescue is organizing a holiday bazaar on Saturday the 13th, to be held at the Denver Cat Company. Plan on swinging by to say hello to the cats and to make a dent in your holiday shopping while helping the shelter! MEOW! Charcoal Restaurant hosts the Scandinavian holiday, St. Lucia, every year by offering a traditional holiday julbord buffet. The buffet includes a lot of really delicious Scandinavian dishes, a well as glogg, which is spiced mulled wine. The restaurant will also be decked out in holiday decorations, making it even more festive. Cost of the buffet is $35/person, 1/2 price for kids 12 and under. This price excludes drinks, tax, and tip. Come join the Denver Film Society for some holiday cheer as they present a FREE screening of the seminal holiday classic, The Polar Express. Following the screening there will be a visit from Mr. and Mrs. Claus and some holiday treats! A wonderful (and free) way to spend the afternoon! Shakey Graves sold-out all three of his Bluebird shows months in advance. But you can see him play a brief set for FREE at 3pm at Illegal Pete’s! Attendees are encouraged to get there early as possible to secure a spot. Proceeds from the food/bar go to Youth on Record. Dinner, drinks, comedy, and karaoke = best date ever. Come check-out this new(ish) monthly showcase at the only 5-star dive-bar in Denver. 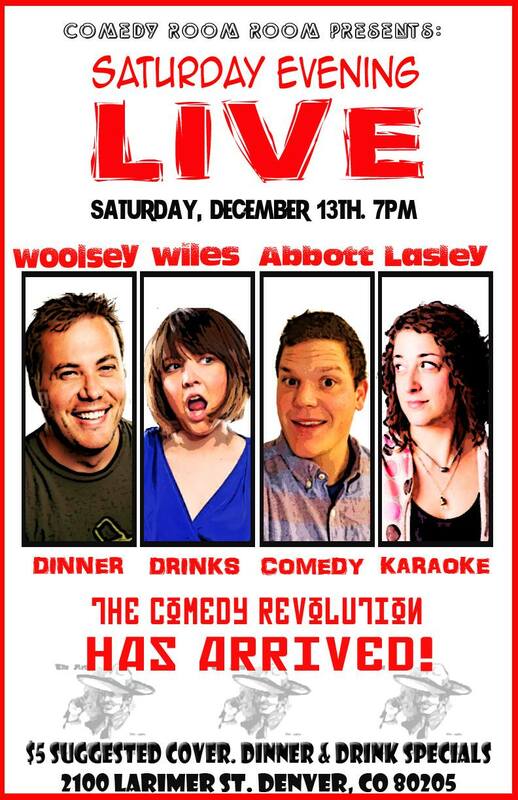 This month’s show includes funny people Robert Abbott, Mara Wiles, and headliner, Elliot Woolsey. Plus, a surprise special guest! Hosted by Timmi Lasley. $5 suggested donation with dinner specials to make it extra nice. 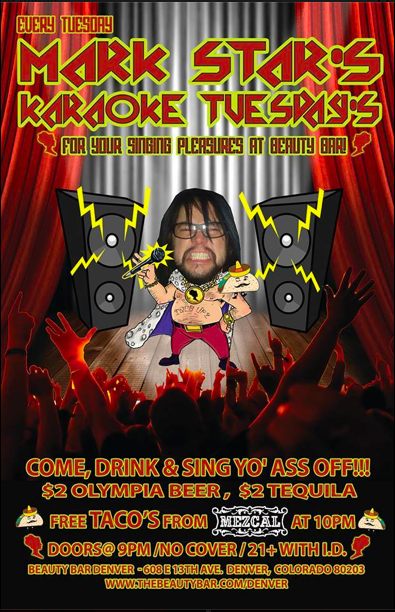 Stick around afterward for some karaoke, starting at 9pm. Studio Colfax is hosting a Happy Holiday Dress Party at the Happy Leaf Kombucha taproom! The party will showcase handmade dresses, aprons, scarves, and skirts by 50 Dresses by Tess Vigil, scarves and capes by Minus the Dart, jewelry by Native Clutter, and bags by JMFT Industries. FREE. The vision behind the party is to offer a slice of nostalgia that will bring booty-shaking, head-nodding, and memories…of all those awesome middle school dances. SNAP! is proud to have hosted some of the most talented DJs/Producers touring the world currently. This month’s DJ line-up includes Garthy Garth, DJ Love, Gary Givant, and DJ A-L. 5 dolla covah. Forget about that embarrassing thing you did this weekend, by eating well and winning big at bingo! Hosted by comedian Nathan Lund, you will be shame-free for at least 30+ minutes. Sunday, December 14, 2014 @ 5pm: Screening: The Big Lebowski at Black Shirt Brewing Co.
What could be better than spending Sunday evenings this winter cozying up to watch a classic movie with a red ale in hand? This week’s film is The Big Lebowski. There will be a special Kahlua Porter on tap and everyone who dresses up will get $1 off their beers all night! Be sure to come early to secure a spot. FREE. Join Wonderbound for a whole new kind of wintry experience that promises to tantalize all five senses. Hear new music by Jesse Manley and his band; see projections by Kristopher Collins; taste creations by a whole slew of renowned local chefs; touch and experience Garrett Ammon’s choreography in a whole new way; and smell scents by Michelle Roark of Phia Lab. Tickets are $60 and are going fast, so don’t delay! Just in time for the holiday season, Former Future is doing a beer & cookie pairing for your pleasure. For $12, you’ll get four 4oz tasters + cookies and for $20 you’ll get four short pours + cookies. YUM! There will also be an ugly sweater contest happening from 6 – 9pm. This is a unique holiday experience, combining both a local market and a discussion about ‘true cost’ and ‘true benefit’ of an item. Hosted by Warm Cookies of the Revolution, attendees will explore the complex issues that surround both buying local and handmade, as well as from global corporations. Come do all your holiday gift shopping with some of the best local artists, businesses, and craftspeople in your community. Plus, there will be music from NO-FVCE, hot cocoa, gift wrapping, incredible raffle prizes, and of course, delicious warm cookies. What’s a better way to celebrate the holidays than a Denver-inspired gift exchange? During this unique happy hour, attendees will enjoy snacks and libations while they meet fellow city builders and exchange Denver-inspired gifts. Attendees will tell stories about why these gifts remind them of Denver, make them feel at home in Denver, and/or represent the future of Denver. Then, they’ll hand those gifts over to a complete stranger (or new friend). Event takes place at Colorado State University, Suite 450, 2nd Floor Meeting Space. FREE. For one night only, it’s the 25th anniversary screening of Roger & Me! Plus! Stick around for the post-screening Skype with Michael Moore! Tickets run $7 – $10. FREE weekly film series, which explores the New Wave movement. In the late 50s, a radical move towards progressive, subversive, deconstructionist, and fiercely political cinema began. Filmmakers in countries all over the world were trying to make sense of their post-war societies, widespread apathy, oppressive communist, socialist, and capitalist regimes and an overwhelming sense of melancholy. Birthed from this perfect storm of pain and confusion was a new kind of cinema yet unknown to the world. Come watch some lesser-seen films from this movement, while enjoying food and drink specials. This week’s film is Japanese Summer: Double Suicide. If you haven’t been to The Narrators before, it is pure gold. It is essentially like This American Life unfolding right in front of your beautiful smiling face. One of the best things to do in Denver – hands down. This month’s theme is “No Returns″. Admission is FREE, plus there is cheap can beer to sip on while you listen, haaaaaaaaaaay. [Cue the Simon & Garfunkel] For one night only, enjoy a screening of The Graduate on the big screen! Tickets run $7 – $10. Many thanks for the interesting report, I also love karaoke.